"A do-it-yourself approach is the key to using the book. ‘Please Make The Songs Work For You!’ Merry­weather exhorts, and the arrange­ments encourage one to do this. Greensleeves, for example, comes not only with tune, bass, chord symbols and intermediate parts that may be sung or played, but also with versions of the original passamezzo antico on which it is based. And if you don’t read music easily, there’s a CD-Rom included, from which you can hear and learn the parts, separately or together. "Another important practical aspect of the book is that it comes in a ring binder, so that it lies flat wherever you open it, and will not disinte­grate with use. So, turn to page 22, Fill ev’ry Glass, and enjoy." Jeremy Barlow, Early Music Today. 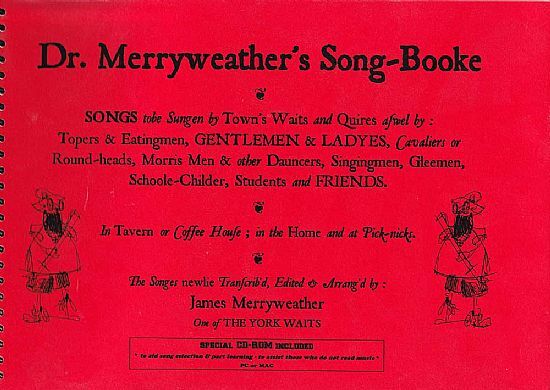 "The eight-page introduction to Dr Merryweather’s Song-Booke: Songs to be Sungen by Town’s Waits and Quires, an extensive manual of 15th- to 19th-century waits songs, includes a potted history of waits (professional town musicians and occasional nightwatchmen). 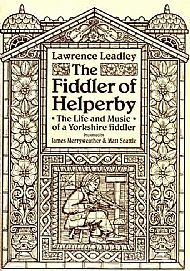 James Merryweather has included information on the origins of the 90-plus part-songs, rounds and choruses, with helpful explanations of ‘ye olde’ spelling and pronunciation. "Included in the pack is a 21st-century learning device, a CD-ROM with MIDI files of each song, suitable for recreational singers who do not read music. Performing notes give useful advice, including an invitation to ‘oblige the song to work for you’ by changing it where necessary. A very well-constructed resource, highly recommended." Jeremy Fisher, Music Teacher. This has long been sold out and out-of-print. However, I have it scanned (PDF), so please let me know if you would like me to send you a copy. One day I really must get round to constructing the second edition (printed with joined-up quavers), promised many years ago. I'm pretty sure this is no longer available. 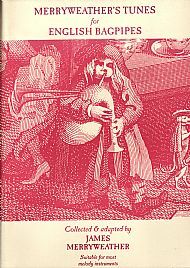 It seems to have disappeared from Dave Mallinson's catalogue, so I can do the same as with the bagpipe book if you let me know you want a PDF copy. 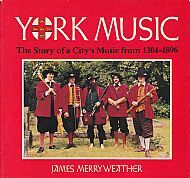 YORK MUSIC - the history of the York waites 14th-19th century. My first book, composed in 1987 on a Commodore 64 (EasyScript) with a daisy-wheel printer and literally copied & pasted with photocopier, scissors and glue. Not bad eh? Well, you'll have to have a look. Long sold out and out-of-print (and the publisher is no more). So, on request, I can send you a PDF scan of the book. Amazon has second-hand copies from time to time and I have a few for sale. Download YORK MUSIC - UPDATE (pdf).